The Yoruba typically turn to a babalawo (diviner) when seeking advice or faced with an illness. An iroke Ifa (also called irofa, iro Ifa, iro ike, orunfa, orun Ifa, orunke or orun ike; meaning ‘tapper of Ifa’) is an object that forms part of the divination ensemble. 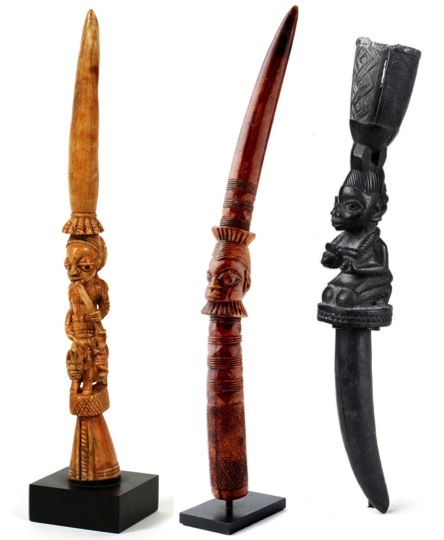 It, along with an opon Ifa, agere Ifa, palm nuts and a number of other objects, are used to invoke the god Orunmila (also called Ifa, the god associated with wisdom, knowledge and divination) during divination processes. While divination is in progress, the babalawo taps a divination tray (opon Ifa) with the pointed end of the iroke Ifa to greet and invoke Orunmila (the tapping sound is meant to attract the attention of Ifa).